Fifth Sundays in a month are Intervisitation Sundays in SEYM. The Worship & Ministry committee encourages Friends to visit other Meetings or Worship Groups in your region on fifth Sundays, to bridge the geographic distance between Friends and strengthen our SEYM community. While the internet helps us a great deal with communication, there’s no substitute for meeting together face-to-face to share worship, fellowship, ideas, spiritual gifts, and support. When you participate in Intervisitation Sunday, tell us about your visit! E-mail our Worship & Ministry Committee Clerk: Clara Diaz. 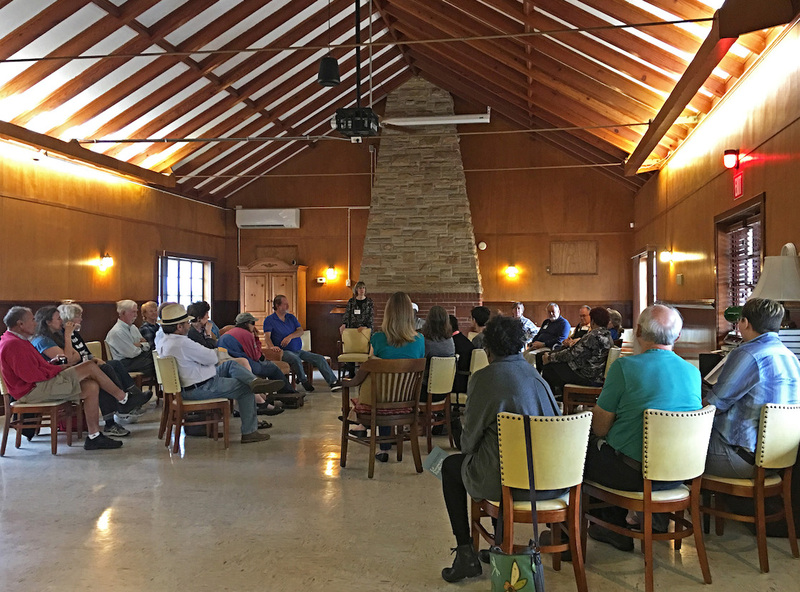 Spiritual State of the Meeting Reports provide us not only with news of other Meetings, but a deeper understanding and appreciation for our Yearly Meeting community. In the process of writing these reports, Friends have the opportunity to pause and reflect, and gather a sense of the ‘Life of the Meeting.’ The result is truly deep and inspiring! At Winter Interim Business Meeting on January 17th, 2015, Friends approved offering an SEYM Spiritual Formation Program to our Monthly Meetings and Worship Groups. 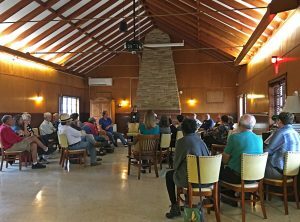 On the Yearly Meeting level, the Program will be the responsibility of a Spiritual Formation Committee, under the care of the Worship & Ministry Committee. 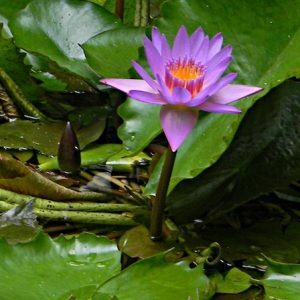 The primary goal of a spiritual formation program is to deepen one’s relationship with the Divine, God, Spirit, or Inner Light through four major avenues: reading devotionally, individual spiritual practice, deep listening and spiritual community. Walking the spiritual path along with others in the group tends to lead to the formation of meaningful and long-lasting relationships. The transformative work of spiritual formation inevitably contributes to the spiritual well-being of the individual, the monthly and yearly meetings. Spiritual Formation Programs have a long and respected history among many religious groups, including the Religious Society of Friends. Both Philadelphia and Baltimore Yearly Meetings have collaborated and published their entire programs on the web in order to serve as models for others. Many yearly meetings in the United States have adapted these models to meet the particular needs of their constituent meetings. SEYM is pleased to welcome you to our program. For complete information on starting a Spiritual Formation Program in your Meeting or Worship Group, download the SEYM Spiritual Formation Program Guide. Worship Sharing is an opportunity for small groups to deepen their understanding of life in the Spirit and get to know each other on a deeper level, through listening to each others’ experiences and insights in a worship-grounded setting. In a covering of silent worship, Friends share their responses to a query that provides a focus for the group. We listen deeply to what is shared, without discussion. Worship Sharing may last an hour, or less, depending in part on the size of the group. Before the session, the Convenor (and/or a committee) decides on a topic or issue for the group to address and writes a query (or queries) for the group to focus on, adding perhaps a few short quotes for inspiration. Queries should be open-ended, inviting participants into contemplation and inward seeking. The Convenor brings copies of the queries, quotes, and the ‘Guidelines for Worship Sharing’ to hand out. 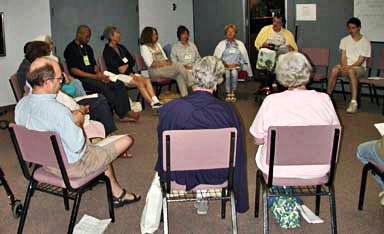 The session begins with Friends being seated in a circle. Sheets with the Guidelines on one side, Queries on the other are handed out. The group reads the Guidelines aloud, each reading a part, going around the circle. The group then enters into silent worship and contemplation of the queries. Each participant is asked to share their response to the queries with the group, speaking from the silence when moved, with the option of not speaking if they wish. The Convenor quietly facilitates the group, seeing that all have the opportunity to speak, and closing the worship with the shaking or holding of hands. We wait in silent worship, in union with each other, and share gleanings from our spiritual journeys. Our purpose is to search together in silence for God’s truth and inspiration. We also hope to draw closer as a community by sharing deeply our spiritual experiences. No Friend is ever required to speak. Be a better listener than a speaker, but if you do share speak up and speak clearly for those who may be hard of hearing. In order to allow the space for each of us to share, be mindful of the length of one’s offering. Typically each Friend shares only one time until all others have spoken. Listen fully to each person’s words. Please do not interrupt or comment upon what another Friend has shared. Allow ample worship between sharings. Hold the gift that each person offers in the Light, without judgment. Try to speak from your own experience, rather than speaking of the experience of others or of abstract ideas. Avoid commenting on, or responding directly to, what someone else has said. One may, of course, share on themes or concerns raised by another as they apply to one’s own life. Please do not repeat elsewhere what you have heard. Please respect the confidentiality of what is shared in the Worship Sharing session. Worship sharing depends on our respecting and honoring each other. 2012 Gathering: Make a Joyful Noise at Every Opportunity! These Queries are offered as starting points for the writing process. It is suggested that Friends choose only four or five queries to work from.